Alleluia! Christ is risen! Easter is not just a day, but a season of celebrating the resurrection of Jesus from the dead. The Gospel passage for the 2nd week of Easter (this past Sunday) was John 20:19-31, where Jesus mysteriously showed up twice through/behind a closed door to be with his disciples who were gathered together. The first time, they were all there except for Thomas. The second time, however, Thomas was there along with the rest. A week (or so) separated the incidents, and I can’t help but imagine that that week must have felt like an eternity for Thomas, who wanted no less of an encounter with the risen Jesus than what the others were afforded, but was merely told it was true that Jesus was no longer dead. Underneath the surface, there is something quite wonderful, however, about that week and the relationship between Thomas and the other disciples. That is that despite Thomas’ struggles, his doubts, his defiance at demanding further proof, the others did not cast him out, condemn him, shame him, or beat it in his brains to “just believe!” No, they sat with him in his doubts, broke bread with him (surely more than once in the course of the week), allowed him to struggle and waited with him until the Lord graciously and peacefully returned in their midst. And sure enough, Jesus showed up again. Though there’s no record of a meal with his disciples in these two gatherings when Jesus appeared, there is, nonetheless, something beautifully sacramental about what takes place and our senses and minds can be drawn to the holy mysteries of Jesus’ resurrection and the meal we celebrate as we await Christ’s return in final victory where we will feast at the heavenly banquet. In those two encounters, Jesus’ presence was real in the midst of his followers, who were gathered together. He gave words of peace and reconciliation, and offered his body and the marks where he had bled to not just be seen, but even to be touched by those seeking the truth. And he breathed on them the Holy Spirit, sending them into the world as the Father had sent him. If you listen carefully to these parts of the story, you will notice that each of these aspects is integral to our understanding of the Eucharist, or Holy Communion. Thank you for this good word. I always draw strength from messages. An insightful reflection! I’ve always had a little different interpretation of Thomas’ encounter with the Risen Lord. When the Risen Christ appeared to Thomas and the other disciples and Jesus focused his attention on Thomas and said “put your finger into the nail scars in my hand and thrust your hand into the wound in my side. Thomas don’t doubt but believe”. I believe that Thomas didn’t need to do either of those things. Rather, he fell to his knees proclaiming, “My Lord and my God”. Agreed! 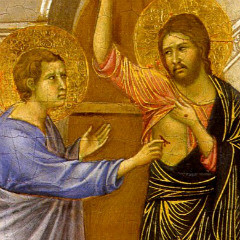 The paintings of Thomas actually extending his hand and touching the wounds are giving details that aren’t in the story. That’s why in the words I shared in the post, I tried to draw attention to Christ’s invitationto Thomas to “touch,” just as Christ “invites to his table…” But you’re right. Thomas didn’t need to do either, but made the proclamation.